A new range of submersible dual output level and temperature transmitters is now available from instrumentation specialist Impress Sensors & Systems Ltd. Manufactured in the UK by Impress Sensors, the new transmitters are suitable for continuous submersion in liquids such as water, oils and fuels. The sensors are available in ceramic (IMCTL) or silicon (IMSTL). All sensors provide dual independent, 2-wire, 4-20mA outputs: one for level and one for temperature, with no signal loss over long cable lengths. The sensors offer nominal pressure ranges from 10mWG to 100mWG (ceramic) and 0.5mWG to 100mWG (silicon). The temperature sensor is based on a platinum resistance thermometer with Class ‘B’ accuracy (other accuracy classes are also available). The sensor housing is either 316L stainless steel, high grade Duplex stainless steel or a Marine bronze option for the IMCTL, making the transmitters ideal for hydrostatic level measurement, where temperature is also a critical factor in measurements. All sensors are temperature-compensated and calibrated and supplied with a traceable serial number and calibration certificate. Operating (media) temperatures are from -20 deg C to +60 deg C in non-freezing media. Cable material is PUR, with PVC, FEP or TPE as options. The IMSTL is the higher accuracy version and uses the latest piezoresistive media-isolated silicon sensing technology and a stainless steel diaphragm. 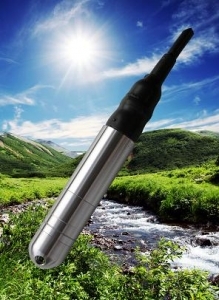 This provides excellent stability, repeatability and resolution, particularly for high accuracy level and temperature measurement (including V-notch weir flow measurements) in rivers, canals, reservoirs, boreholes and aquifers. The IMCTL is also designed for submersion in liquids such as water, oil and fuels. This device uses a ceramic sensor for level measurements, which provides excellent corrosion resistance, particularly where the media may be aggressive. Applications include level and temperature measurements in storage tanks, rivers, boreholes and aquifers, as well as environmental monitoring in estuaries and seawater applications (when used with the marine bronze housing).